I had a great time at a workshop hosted by the Montrose Library and Carole London of London Publishing. 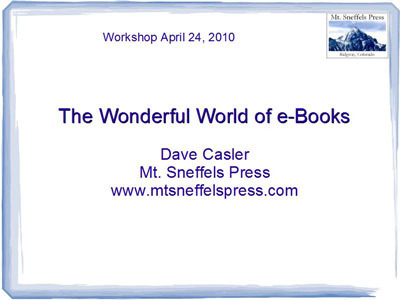 I was asked to speak on e-books. Those wishing to see the slides I presented at the ebook workshop can find them here. To prepare for the conference, I put my first broom book up on Smashwords. That’s a feeder site for Barnes and Noble, Sony, and the new Apple bookstore. You can see the details in the charts. Answer: No, there is no preference for size. In fact, the size of the paper is not a consideration. An e-book is simply a file that an e-book reader, such as Kindle, formats for display. The reader determines how big the text will be (see the samples on this chart). So the concept of page numbers is meaningless. And, no, the length of the book does not matter. That’s entirely up to you. And, re POD, no, I don’t offer that service. There are any number of outfits online who will do that. I personally have a rather low opinion of such companies, many of whom charge large ‘setup’ fees that I don’t think are necessary. But I can point you toward a printer I like. See the Technology Page. In all fairness, I should point out that Amazon has a POD service and so does Smashwords. But you will have to provide finished files for them—just as you would for a printer. Answer: Your submitted text should be pretty much continuous. The Smashwords Style Guide and Smashword’s sample manuscript give examples. You end your chapter, hit return a couple times, put in your chapter title or number, hit return, and continue with your text. Smashwords offers an interesting idea: after carefully making a backup of your original manuscript, save your document as pure text, then import it back into your word processor. (I use Open Office Writer instead of Word—it’s free and better-behaved.) Doing so completely eliminates the formatting. You may want to go back in and bold your chapter headings or do other minor formatting. At the same time, take out all the white space (long strings of carriage returns without any text). Both Amazon (Kindle) and Smashwords (Nook, etc.) do not like .pdf. I tried it once—it came out really weird. They do like Microsoft Word .doc files. (Open Office Writer can create these too.) But if you have strange formatting in your .doc file, and it sounds like you do, very carefully save a backup copy and name it something else, and then experiment with the various ways to export your manuscript as text (Word has two or three ways to do this) and experiment with importing them back into Word until you get what you want. This entry was posted in Writing: Business. Bookmark the permalink.